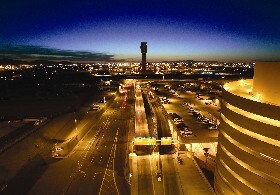 Phoenix Sky Harbor International Airport in Arizona is one of the ten busiest airports in the world. A typical day at Sky Harbor sees 108,887 passengers arrive and depart along with 808 tons of cargo on 1,486 airplanes. 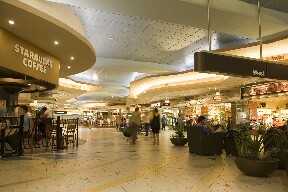 Sky Harbor has seen continuous growth since the site was first purchased by the City of Phoenix in 1935. Four terminals have been built and remodeled, and a new terminal is being planned. Support facilities including cargo terminals, fire stations, parking structures and, most recently, a rental car center have been added. Airport operations continue 24 hours a day and while there are quiet times, security requirements never lapse. Illumination is key to operation and to security, and so lighting fixtures must remain on for extended periods of time. The dedicated Aviation Department engineers that maintain the airport facilities work hard to establish procedures that will prolong the life of their equipment and minimize outages under these grueling conditions. The logistical requirements of their operations are enormous and department personnel count on Watt Stopper/Legrand lighting controls to facilitate their efforts. To maintain the lighting installed in millions of square feet of buildings spread over the 285-acre airport, they carefully follow lamp and ballast manufacturers’ recommendations for duty cycles, and schedule off times for as much of the lighting as possible to maximize component life. Controlling energy usage is also a goal, but existing circuitry limits the ability to reduce lighting levels. With an eye toward conservation, the staff seeks to harness the abundant contribution of daylight available year round in this desert location. Skybridges and other areas with large windows as well as perimeter areas of the parking structures rely, at least in part, on natural lighting whenever possible. When examining the total energy savings for the project, the picture became even rosier. The airport’s scheduled control is made possible by more than 140 lighting control panels installed over 17 years throughout the complex. Many of the panels were retrofitted onto existing electrical circuits. Networked control makes the scattered panels accessible from either of two central locations and helps with the maintenance tasks in a number of ways. The Aviation Department’s User Technology Specialist responsible for the system has developed a control schedule for each area that periodically cycles the lighting off during a time that will least impact operations to extend lamp and ballast life. Establishing the airport network was not without challenges, primarily due to the distances involved in such a large installation, as well as certain aspects of the topology. Proper grounding has been one of the keys to success and even the oldest terminal has been retrofitted. The User Technology Specialists are extremely proud of their accomplishments with such an extensive system. They report that the software helps enormously and is rock solid. Airport engineers anticipate that adjustments will be needed whenever a new building is added due to the complexity of the many systems involved. The latest addition to the network suffered initial glitches as a result of interference from motor controls that were part of the baggage handling system. Relocating the data line to better meet the manufacturer’s specifications solved the problem. The airport maintains its own intranet and this provides personnel with multiple ways to program and access the panels. Watt Stopper/Legrand’s WebLink, that allows authorized personnel access to all the lighting control panels from any location, is especially helpful. To ensure absolute security, the Sky Harbor panels are not accessible via the Internet. While the primary mode of lighting control is the scheduling system, daylighting controls are integrated into this in several locations. On skybridges, photocells will override off times scheduled during the day if the daylight contribution is insufficient to properly illuminate the area. Sky Harbor engineers also control exterior lighting using the astronomic time clock function built into every lighting control panel. With this, the off and on times for the lights automatically adjust each day relative to sunrise and sunset based on the longitude and latitude of the project site. Recently new Watt Stopper/Legrand photocells, available either for use in interior or exterior spaces, have been added to the system. The photocells provide direct information to the lighting control panels on the levels of ambient lighting and the WinControl software incorporates this information into its calculations. All adjustments are made using the software, so the photocells never have to be accessed following installation. Sky Harbor Aviation Department personnel have been pleased with the performance of Watt Stopper/Legrand products as well as the level of support received from the company over the years. They have also appreciated the consistency of personal contacts including the local rep firm. Watt Stopper/Legrand controls continue to serve as the basis of the design specifications for new airport construction projects.